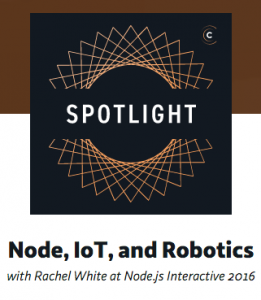 IBM and StrongLoop sponsored Changelog’s The Future of Node Spotlight series at Node Interactive 2016. Adam spoke with event attendees about Node.js and the Node community. In this podcast, Adam discussed Node, IoT and robotics. This episode of The Future of Node series was recorded at Node Interactive 2016. Adam Stacoviak spoke with Rachel White, Technical Evangelist at Microsoft, about Node, IoT, and robotics. They discussed a variety of topics: making robots; inspiring developers to try new things; having fun as a developer; letting go of imposter syndrome; RFID implants, and; making stuff for fun outside of our day to day jobs.